German postcard by ISV, no. A 17. Photo: 20th Century Fox. Gary Cooper in Garden of Evil (Henry Hathaway, 1954). American screen legend Gary Cooper (1901-1961) is well remembered for his stoic, understated acting style in more than one hundred Westerns, comedies and dramas. He received five Oscar nominations and won twice for his roles as Alvin York in Sergeant York (1941) and as Will Kane in High Noon (1952). Frank James Cooper was born in Helena, Montana in 1901. His parents were English immigrants, Alice Cooper-Brazier and Charles Henry Cooper, a prominent lawyer, rancher, and eventually a state supreme court judge. Frank left school in 1918 and returned to the family ranch to help raise their five hundred head of cattle and work full-time as a cowboy. In 1919, his father arranged for his son to complete his high school education at Gallatin County High School in Bozeman, Montana. His English teacher, Ida W. Davis, played an important role in encouraging him to focus on academics, join the school’s debating team, and become involved in dramatics. He was in a car accident as a teenager that caused him to walk with a limp the rest of his life. In the fall of 1924, Cooper’s parents moved to Los Angeles to administer the estates of two relatives. Cooper joined them and there he met some cowboys from Montana who were working as film extras and stuntmen in low-budget Western films. Cooper decided to try his hand working as a film extra for five dollars a day, and as a stuntman for twice that amount. In early 1925, Cooper began his film career working as an extra and stuntman on Poverty Row in such silent Westerns as Riders of the Purple Sage (Lynn Reynolds, 1925) with Tom Mix, and The Trail Rider (W.S. Van Dyke, 1925) with Buck Jones. Cooper paid for a screen test and hired casting director Nan Collins to work as his agent. Collins changed his first name to ‘Gary’ after her hometown of Gary, Indiana. Cooper also worked in non-Western films. He appeared as a masked Cossack in The Eagle (Clarence Brown, 1925) with Rudolph Valentino, as a Roman guard in Ben-Hur (Fred Niblo, 1925) with Ramón Novarro, and as a flood survivor in The Johnstown Flood (Irving Cummings, 1926) with George O’Brien. Gradually he began to land credited roles that offered him more screen time, such as Tricks (Bruce M. Mitchell, 1925), in which he played the film’s antagonist. As a featured player, he began to attract the attention of major film studios and in June 1926, Cooper signed a contract with Samuel Goldwyn Productions. His first important film role was in The Winning of Barbara Worth (Henry King, 1926) with Ronald Colman and Vilma Bánky. The film was a major success, and critics called Cooper a "dynamic new personality" and future star. Cooper signed a five-year contract with Jesse L. Lasky at Paramount Pictures for $175 per week. In 1927, with help from established silent film star Clara Bow, Cooper landed high-profile roles opposite her in Children of Divorce (Frank Lloyd, 1927) and Wings (William A. Wellman, 1927), the first film to win an Academy Award for Best Picture. With each new film, Cooper’s acting skills improved and his popularity continued to grow, especially among female movie-goers. He received a thousand fan letters per week. The studio placed him opposite popular leading ladies in films such as Beau Sabreur (John Waters, 1928) with Evelyn Brent, Half a Bride (Gregory La Cava, 1928) with Esther Ralston, and Lilac Time (George Fitzmaurice, 1928) with Colleen Moore. The latter introduced synchronized music and sound effects, and became one of the biggest box office hits of the year. In 1929, Gary Cooper became a major film star with his first sound picture, The Virginian, (Victor Fleming, 1929). The Virginian was one of the first sound films to define the Western code of honour and helped establish many of the conventions of the Western genre. The romantic image of the tall, handsome, and shy cowboy hero that embodied male freedom, courage, and honour was created in large part by Cooper’s performance in the film. Cooper transitioned naturally to the sound medium, with his deep, clear, and pleasantly drawling voice. One of the high points of Cooper’s early career was his portrayal of a sullen legionnaire in Josef von Sternberg’s Morocco (1930) with Marlene Dietrich in her American debut. Cooper produced one of his finest performances to that point in his career. In the Dashiell Hammett crime drama City Streets (Rouben Mamoulian, 1931) he played a misplaced cowboy in a big city who gets involved with gangsters to save the woman (Sylvia Sidney) he loves. After making ten films in two years Cooper was exhausted and had lost thirty pounds. In May 1931, he sailed to Algiers and then Italy, where he lived for the next year. During his time abroad, Cooper stayed with the Countess Dorothy di Frasso who taught him about good food and vintage wines, how to read Italian and French menus in the finest restaurants, and how to socialize among Europe’s nobility and upper classes. In 1932, a healthy Cooper returned to Hollywood and negotiated a new contract with Paramount for two films per year, a salary of $4,000 per week, and director and script approval. He appeared opposite Helen Hayes in A Farewell to Arms (Frank Borzage, 1932), the first film adaptation of an Ernest Hemingway novel. Critics praised his highly intense and at times emotional performance, and the film went on to become one of the year’s most commercially successful films. The following year, Cooper appeared in the Ernst Lubitsch comedy Design for Living (1933) with Miriam Hopkins and Fredric March, and based loosely on the successful Noël Coward play. Wikipedia: “The film received mixed reviews and did not do well at the box office, but Cooper’s performance was singled out for its versatility and revealed his genuine ability to do light comedy”. Then, he appeared in his first of seven films by director Henry Hathaway, Now and Forever (1934), with Carole Lombard and Shirley Temple. The film was a box-office success. His next two Henry Hathaway films were the melodrama Peter Ibbetson (1935) with Ann Harding, about a man caught up in a dream world created by his love for a childhood sweetheart, and the romantic adventure The Lives of a Bengal Lancer (1935), about a daring British officer and his men who defend their stronghold at Bengal against rebellious local tribes. The latter was nominated for six Academy Awards and became one of Cooper’s most popular and successful adventure films. Gary Cooper returned to Poverty Row for the first time since his early silent film days to make Mr. Deeds Goes to Town (Frank Capra, 1936) with Jean Arthur for Columbia Pictures. Cooper plays the character of Longfellow Deeds, an innocent, sweet-natured writer of greeting cards who inherits a fortune, leaves behind his idyllic life in Vermont, and travels to New York where he faces a world of corruption and deceit. For his performance in Mr. Deeds, Cooper received his first Oscar nomination. In the adventure film The General Died at Dawn (Lewis Milestone, 1936) with Madeleine Carroll, he plays an American soldier of fortune in China who helps the peasants defend themselves against the oppression of a cruel warlord. Written by playwright Clifford Odets, the film was a critical and commercial success. In Cecil B. DeMille’s sprawling frontier epic The Plainsman (1936) with Jean Arthur—his first of four films with the director—Cooper portrays Wild Bill Hickok in a highly-fictionalized version of the opening of the American western frontier. That year, Cooper appeared for the first time on the Motion Picture Herald exhibitor’s poll of top ten film personalities, where he would remain for the next twenty-two years. In Ernst Lubitsch’s romantic comedy Bluebeard’s Eighth Wife (1938) with Claudette Colbert, Cooper plays a wealthy American businessman in France who falls in love with an impoverished aristocrat’s daughter and persuades her to become his eighth wife. In the adventure film Beau Geste (William A. Wellman, 1939) with Ray Milland, he joined the French Foreign Legion to find adventure in the Sahara fighting local tribes. Wikipedia: “Beau Geste provided Cooper with magnificent sets, exotic settings, high-spirited action, and a role tailored to his personality and screen persona.” Cooper cemented his cowboy credentials in The Westerner (William Wyler, 1940). He won his first Academy Award for Best Actor in 1942 for his performance as Alvin York, the most decorated U.S. soldier from the Great War, in Sergeant York (Howard Hawks, 1941). Cooper worked with Ingrid Bergman in For Whom the Bell Tolls (Sam Wood, 1943) which earned him his third Oscar nomination. The film was based on a novel by Ernest Hemingway, with whom Cooper developed a strong friendship. On 23 October 1947, he appeared before the House Un-American Activities Committee in Washington, not under subpoena but responding to an invitation to give testimony on the alleged infiltration of Hollywood by communists. Although he never said he regretted having been a friendly witness, as an independent producer, he hired blacklisted actors and technicians. He did say he had never wanted to see anyone lose the right to work, regardless of what he had done. Cooper won his second Oscar for his performance as Marshal Will Kane in High Noon (Fred Zinnemann, 1952), one of his finest roles and a kind of come-back after a series of flops. He continued to play the lead in films almost to the end of his life. His later box office hits included the influential Western Vera Cruz (Robert Aldrich, 1954) in which he guns down villain Burt Lancaster in a showdown, William Wyler’s Friendly Persuasion (1956), in which he portrays a Quaker farmer during the American Civil War, Billy Wilder’s Love in the Afternoon (1957) with Audrey Hepburn, and the hard-edged action Western Man of the West (Anthony Mann, 1958), with Lee J. Cobb. Cooper’s final film was the British-American co-production The Naked Edge (Michael Anderson, 1961). In April 1960, Cooper underwent surgery for prostate cancer after it had metastasized to his colon. But by the end of the year the cancer had spread to his lungs and bones. 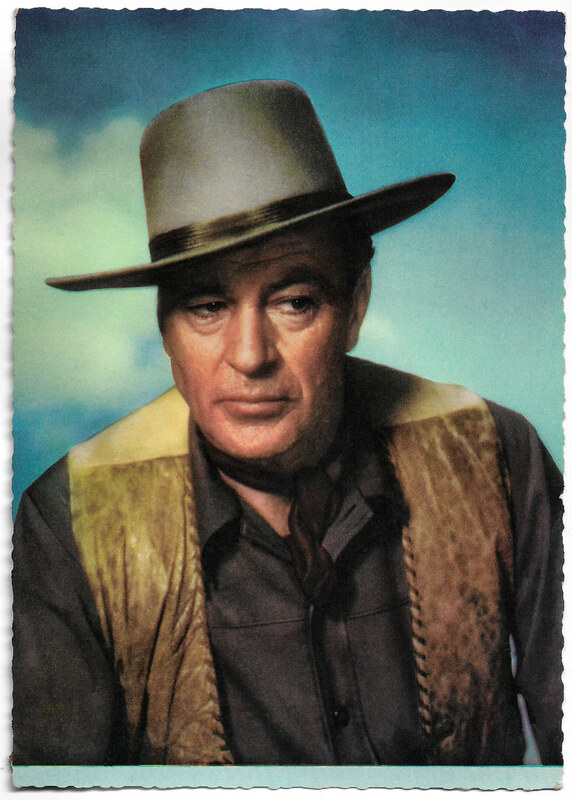 On 13 May 1961, six days after his sixtieth birthday, Gary Cooper died. The young and handsome Cooper had affairs with Clara Bow, Lupe Velez, Marlene Dietrich and Tallulah Bankhead. In 1933, he married socialite Veronica Balfe, who, billed as Sandra Shaw, enjoyed a short-lived acting career. They had an ‘open’ marriage and Cooper also had relationships with the actresses Grace Kelly, Anita Ekberg, and Patricia Neal. Sir Cecil Beaton also claimed to have had an affair with him.